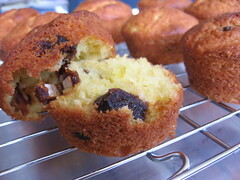 Orange Date Muffins - Do You Know The Muffin Man? Notes: I melt the butter instead of processing it with the orange. Otherwise, the small pieces of fat don't properly incorporate into the batter. Serious orange flavour without too much bitterness even though the pith is included. The only tricky part is compensating for the size and juiciness of the orange. One of my favourites.